Today I put together my new-to-me Shannock tapestry floor loom. It’s good that I’m talented at reading instructions and making sense out of a mess, because although it was meticulously packed, I missed that there were three separate instruction packets for the loom. It can be converted to a four-harness table loom so there are quite a few extra parts for that. Finally I realized that I was looking at the wrong instructions for the version I was putting together, and then it all came together quickly. It is very heavy and sturdy, and it looks like it will be easy to warp up. 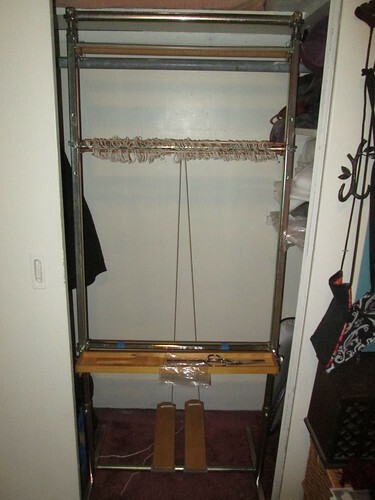 The best thing is that it fits very neatly into one half of my closet, so I can protect my weaving from the ravages of the Destructo-Kitties. I had worried about that quite a bit. Now I won’t have to.